Grown for the masses of yellow flowers that cover the plant in late spring, Verticordia chrysantha is commonly called the Yellow Feather flower. Often used as a feature plant in the garden border, or planted in drifts for a mass display in spring. 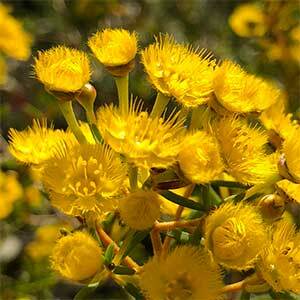 Verticordia species are planted in full sun in a well drained soil. An open position with good airflow will help prevent fungal problems. To aid with establishment it is nest planted in early autumn which it time to develop a sound root system before its first summer. Once planted, water in well with a liquid seaweed fertiliser. Mulch around the plant to maintain cool moist root run. When the buds begin to form, and when in flower some extra water trough any dry periods will improve flower production. This is a species that can be pruned, light pruning after flowering will maintain a bushy compact habit and more flowers. Common Name – Yellow Feather Flower. Flowers – Yellow, darkening as they age. Foliage – Heath like and mid green.